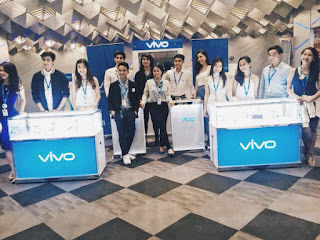 Manila,Philippines -- Vivo Club Philippines, an exclusive club made for college students by Vivo Mobile have made its first Philippine event by organizing a block screening of Captain America: Civil War. Flocks of college students march their way last Friday (April 29) at SM Megamall's IMAX and Director's Club Cinema, to witness another Marvel's greatest. One of the students that we have interviewed during the event told us, that they have won a Facebook contest organized by Vivo Club, in which the mechanics of the game for you to win cinema tickets, is that you need to comment with the name of your 4 friends below the picture being posted everyday, after that, you need to post it together with the hashtag #VivoClubPH. The Brand Ambassadors of Vivo Club ushered the students in going inside the cinemas and provided them with pop corns and drinks to further enjoy watching the movie. The Brand Ambassadors or Vivo Club also gave the students some Vivo coins banks and branded fans. Before the movie starts, some of the brand ambassadors of the mobile brand was introduced to the people inside the cinema and encouraged more students to join their future event activities and raffles. Vivo Mobile Phones are the official handsets used in the movie Captain America: Civil War, starring Chris Evans, Robert Downey Jr. and many more. Civil War is now showing in cinemas starting April 27.